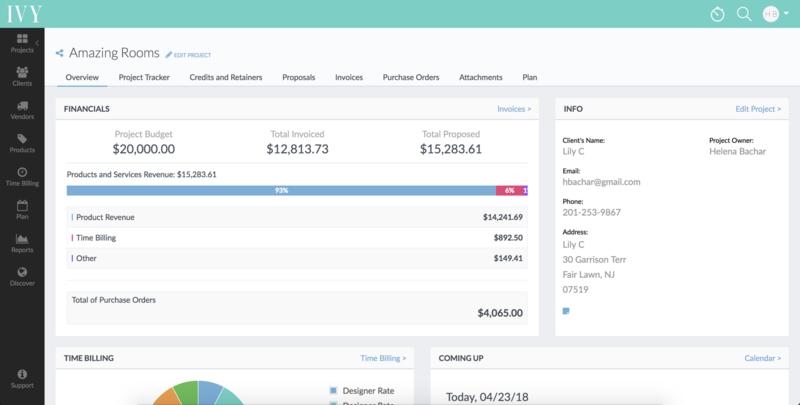 The Project Dashboard gives you an overview of the health and progress of your project including, budget, revenue, and time billing. Budget - allows you to see how you're doing against the total project budget. It displays the total project budget (which can be set when creating or editing a project), the total value of all invoiced items, and the total value of all the proposed/invoiced items. Revenue - displays a breakdown of revenues based by product and services, where services are broken down by their individual categories. Revenues are calculated off of planned and actual payments on line items that are either in a proposal or invoice (or both). Total Purchase Orders - sums up the value of all purchase orders, both open and paid. The "Info" panel shows you the client details, project's owner, and any additional notes entered in the "General Notes" field. All this information can be edited by clicking on the "Edit Project" link. 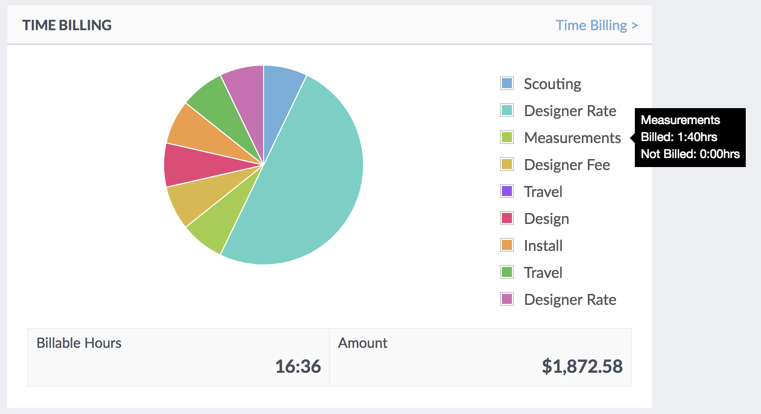 The "Time Billing" panel breaks down the all entered time (billable and non-billable) into a pie chart by the service name, giving you a holistic view of the work done on the specific project. Hovering over the individual services, will show you how much time has been billed and how much has yet to be billed. In addition, you can also see the total billable hours logged on the project and their total amount based off of the hourly rate. You can get an overview of your week directly in the dashboard, making it easier to understand what To Do items you have due, or what scheduled events/meetings you have planned. You can also see a full list of your To Do items and your calendar events by going to the "Plan" tab directly in the project. 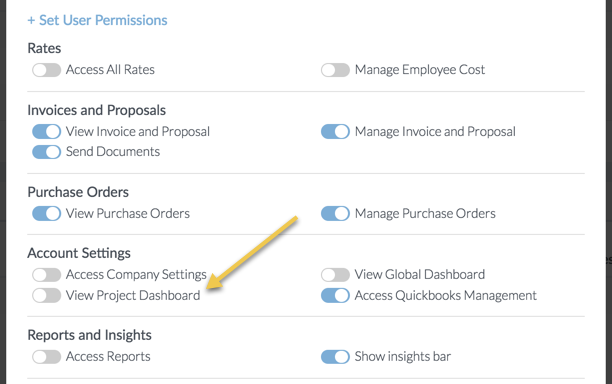 Only team members who have the "View Project Dashboard" permission enabled in their account will have the ability to view the dashboard. By default, this is enabled, but can easily be turned off by going to "My Account" --> "Team/Rates", once there, simply click on the team members name, and then disable the "View Project Dashboard" toggle in the "User Permissions" section.